Relocating your business can be a daunting yet exciting task. Once you have found a new location for your business to grow and flourish, the whirlwind moving process begins. From planning, coordinating, and packing to physically moving your belongings from point A to point B, the last thing you want is for an office move to get in the way of conducting business as usual. Oftentimes, relocating an entire office — no matter the size — becomes an all-encompassing task. However, hiring commercial movers can not only make your business relocation quick and efficient, it can also be a lot less stressful on you, your employees, and your patrons. But in a sea of office movers in Orlando, how do you know which commercial moving company is the right fit for you? Visit J&J Moving and Storage to talk with our team and get a no-obligation estimate for your business move. 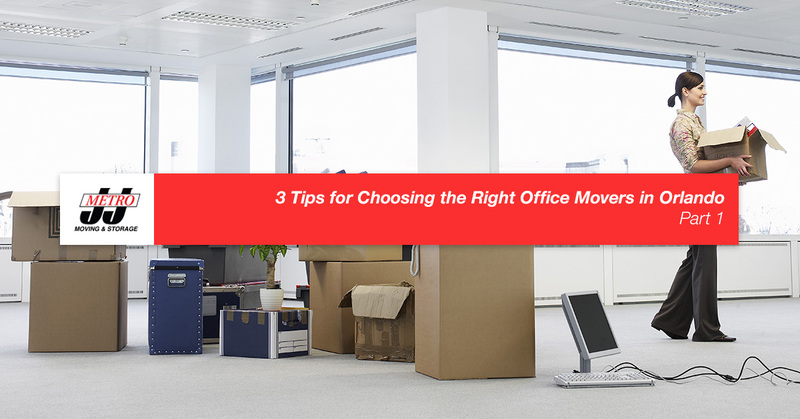 In the meantime, here are three tips to help you choose the right office movers for you. It’s easy to simply search “office movers near me” on the internet and choose the first one that pops up, but it’s essential to research the moving company before making a firm decision. Just by looking at the company’s website, you can gain many insights into the business. Look for information showing their affiliation and rating with the Better Business Bureau. If there isn’t any information on their website, you can always search the company on the BBB search portal to learn more about them. Also, read the moving company’s About Us page to learn about the company, it’s history, and it’s overall mission. You can also access the FAQs page which will tell you a great deal about the company. Here, you should be able to find information about their license, hiring practices, moving crews, and more. As you research, jot down notes you may want to ask them when you request a quote or schedule a move. Next, you can broaden your research by reading reviews to see what actual customers are saying. Reviews are highly valuable when you’re researching a commercial moving company. While you can access testimonials and reviews on a company’s site, you can also search Top Rated Local® to learn more about the company and read reviews. Also, keep an eye out for badges on the company’s website showing the company’s Google rating. While you can see an up to five-star rating, you can also click it to read customer reviews. Consider the raving reviews and those not-so-flattering reviews that just about any business is likely to have. Most importantly, keep an eye on common themes (weighing both the positives and negatives), which can help you determine if a company is right for you. Experience is a must. While all businesses must start out somewhere, hiring experienced movers can mean the difference between a chaotic move and a streamlined business relocation. Office movers with several years and decades of experience and a long-lasting business can be a sign that the company has a good customer rapport, has fine-tuned their craft, and continues to learn and grow as a successful local moving company. Take J & J Moving and Storage, for instance. We have been in business for 50 years now and in that time, we have determined what works and what doesn’t while continuously developing the safest, most effective, and most efficient methods for relocating businesses. This is partly why we are one of the most trusted commercial moving companies in Orlando. These are just some of the pro tips we have for you to help you choose the right office movers for you, so be sure to join us next time for more helpful tips. If you are ready to choose professional office movers in Orlando who uphold an unwavering commitment to honesty and integrity in everything we do, with excellent customer reviews, and 50 years of experience in the commercial moving industry, choose J & J Moving and Storage. We are dedicated to making your move as quick, efficient, and streamlined as possible. Call or click for an instant, no-obligation quote and let our friendly and reliable office movers move your business for you.